The fight to get court-appointed guardians and attorneys to allow 69 year old Beverley Finnegan to receive life-saving medical treatment has ended with her death just before noon on Friday, January 5, 2018. Her tragic death follows the one day that her sister and advocate Janet Pidge were not able to be by her side at Framington Union Hospital due to a brutal snowstorm. Beverley's condition was largely unchanged during the last several weeks, so the Friday morning phone call came as a shock. Family attorney Lisa Belanger calls it "euthanasia" - the hastening of Beverley Finnegan's death. Belanger attempted to file a criminal complaint on Saturday, since euthanasia is illegal in Massachusetts. However, the police denied her request, telling her to file medical malpractice instead. 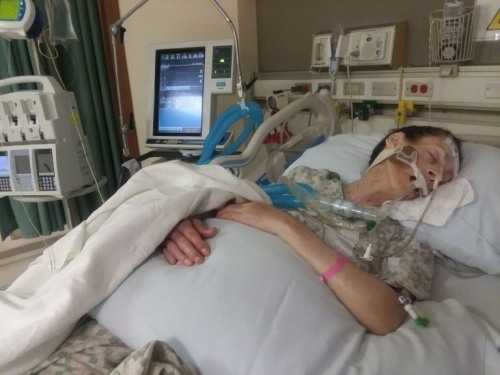 This woman who was functional, in full control of her mind, and able to walk and care for herself on her own just a few months ago is gone - another victim of guardianship, which allowed police to physically break down the door to her condo and admit her to a psych ward against her wishes and the wishes of her family. What really happened to Beverley Finnegan - both in the nursing home before her hospitalization and in the hospital during the snowstorm, during the time that her sister could not watch over her and try to protect her? Is there a cover-up happening of medical malpractice? What kind of benefit is there to those parties networked together? Why are there so many entities and individuals working to take away the basic human rights of senior citizens? How can citizens protect themselves from the tyrannical overreach of people operating under the color of law to take all their worldly goods as well as their very liberty? Is anyone safe? Beverley Finnegan's voice has been silenced. Will her death go unnoticed, or will it mean something? Who will speak out for justice for her and for countless others whose lives are being stolen? To stop my sweet sister BEVERLEY A. FINNEGAN and JANET J. PIDGE from filing another lawsuit against powerful government officials and Barclay Condominium of Newton's illegal trustee board, Middlesex Cambridge Probate Judge Maureen H. Monks and her criminal team planned and carried out the MURDER HIT. Back in August, 2016, Finnegan, Pidge were denied ALL services from SPRINGWELL, Inc. who was specifically at the Condo to probe elder abuse, condo abuse and police corruption plaguing this shocking criminal case. Another monster involved is Pamela S. DeColo, LICSW, Clinical Director of the JF&CS who claims to work with individuals and their families to ensure the needs of the whole person are met – physical, emotional, and spiritual. SW DeColo is a dangerous elder predator who knew about this rising conspiracy and played a key role in taking away MY sister's precious life! FINNEGAN, PIDGE'S REPEATED EMERGENCY PLEAS FOR PROTECTION WERE FLATLY IGNORED!! MY SISTER NEVER LOST DECISION-MAKING CAPACITY, SHE WAS FULLY COMPETENT AND BLATANTLY KILLED!! !